It would seem that every couple of years Hollywood producers are inclined to present a new, remarkable story about the horrors lived by the Jewish people during World War II. Interestingly enough, after Schindler’s List, these new stories — equally admirable, by all accounts — have failed to resonate with most audiences worldwide. 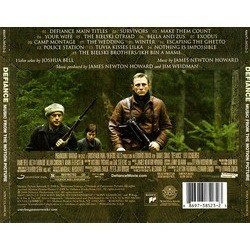 Such is the case of Defiance, a film depicting the story of the Bielski brothers, who fought against the Nazis in the western section of occupied Poland, now part of Belarus. The Bielski brothers lived inside the forest for several years, hiding and protecting well over 1,000 people from the Nazis; ultimately getting recognized for this valiant effort. Sadly, the Bielski brothers and partisans have been accused of committing atrocities that could be considered war crimes. Even though none of the aforementioned has been verified, the allegations have certainly undervalued their rescue and protection efforts. Regrettably, in hopes of making this a more attractive film for action-movie seekers, Defiance focuses more on the villianousness aspect of the brothers, relegating any sense of humanity and emotion to a few scenes. Thus, in order to preserve a more dignified aspect of the real story, director Edward Zwick turned his attention to composer James Newton Howard, with whom he had collaborated in Blood Diamond. Surprisingly enough, Howard opted to employ what is now arguably a clichéd sound in films depicting Jewish suffering: the violin. While the execution by Joshua Bell is impeccable to say the least, the violin’s effectiveness in this particular film seems to be quite in doubt. Howard’s score falls very short of a noteworthy or even functional achievement, due in part to the very one-dimensional musical approach, but more importantly, due to the poor interpretation by the director of an emotional and significant episode in Jewish history. While watching the infamous concentration camp and other heinous Nazi acts of violence, ‘Defiance- Main Titles’ introduces the tonality that will dominate most of the album. The low strings and brass heard at the beginning of the track become an integral part of the remaining score, forewarning some of the darker moments of the film with the use of a three-note motif that will resurface in ‘Making Them Count’. The short introduction of Bell’s violin execution reaffirms the dramatic element of Howard’s work; however, this will not become completely apparent until Survivors, which introduces one of the main motifs of the score near the end, accompanied by a simple string ostinato pattern. As mentioned previously, ‘Make Them Count’ reinstitutes the descending three-note motif heard in the Main titles in order to accompany one of the most disturbing scenes of the entire film. The retrograding aspect of the motif seems to contradict the elements seen on screen, as Tuvia goes forward with the killing of the Nazi officer responsible for his parents’ death. Towards the end of the scene, the violin adopts a different harmonic structure, trying to remind Tuvia of the crime he just committed — which is not very different from what the Nazis had done— but the reality for Tuvia is very different, at this point converting him in an avenger. The track “Your Wife” co-occurs as Zuz learns about the murder of his wife and child. Needless to say, the violin plays a very beautiful theme; sadly never reaching a climactic moment in terms of its dramatic quality. However, this is not Howard’s fault. The scene shows an emotional, yet violent reaction by Liev Scheiber which does reflect the magnitude of such a tragic event, but in a very aggressive approach. The performance by Joshua Bell is very dynamic and passionate, but the theme has no spectacular attributes. The only short-lived, fast-paced music comes in the second half of ‘The Bielski Otriad’. The percussive rhythms and string ostinatos, with a few brass notes, drive ‘Bielski Otriad’ as the brothers ambush a German convoy, leaving some partisans dead and leading to the amusing chase of Asael Bielski. 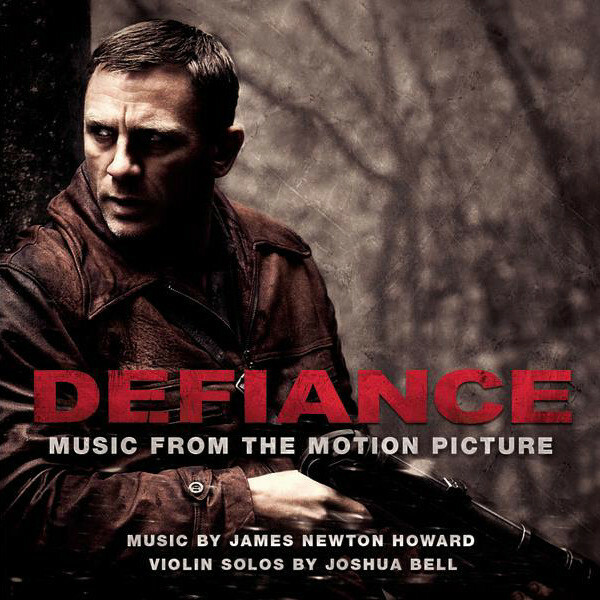 The music loses the beautiful melodic quality of the solo violin and adopts a rhythmic individuality, used to amplify the engaging action scene. This is the only track that seems to somewhat deviate from the norm established by Howard in the first minutes of music. ‘Bella and Zuz’ constitutes one of the weakest tracks of the entire score (right along ‘The Wedding’ and ‘Winter’). The very slow and repetitive woodwind and string ostinatos gradually build up as the approaching Germans slowly force the Bielski brothers to retreat and begin a shootout. There is nothing commendable heard here; the music only serves to intensify the images on screen. Alas, the scene equally disappoints. 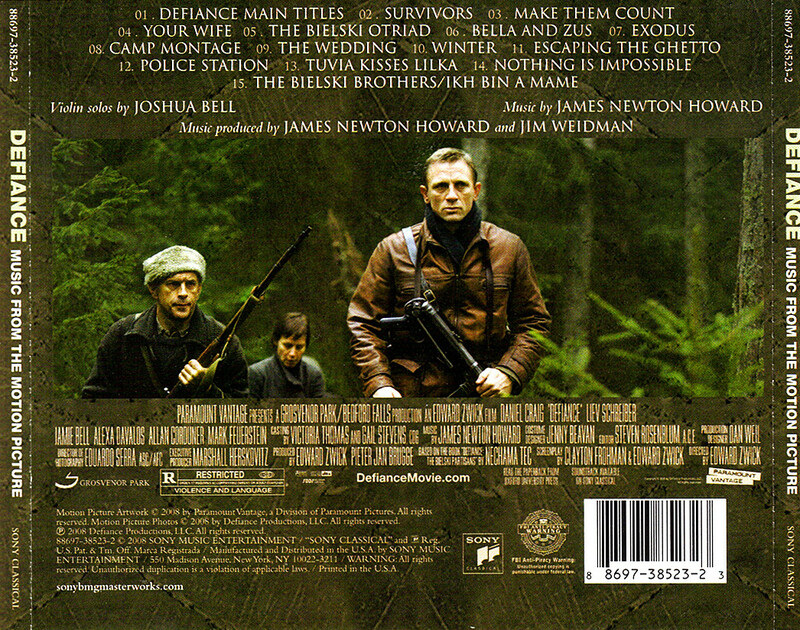 On the other hand,’ Camp Montage’ contains the most emboldened and inspiring undertone of the score. The clarinet plays a pleasing theme that is subsequently performed by the strings in a rousing fashion. This is the time when we get to see the spirit of real cooperation by all the partisans of the Bielski brothers as they rebuild a secure camp for everyone. The most heartfelt and memorable theme can be heard in Exodus (played by the violin, followed by the clarinet) ‘Escaping the Ghetto,’ ‘Nothing is impossible, and for a brief moment in ‘The Bielski Borthers.’ The difficulty with this theme is the inevitable connection to Williams’ Schindler theme. Even though there are notable differences, the nature of Bell’s execution proves too analogous to that of Itzhak Perlman. Nonetheless, the association of the theme to Jewish distress is first achieved in Exodus, as we see the partisans trying to understand how they will survive after losing their temporary home in the forest. Police Station reintroduces the three-note motif heard in ‘Make Them Count’ as it follows a very violent scene. The descending theme disappears in this track once the brass section revives the tonality first heard in ‘The Bielski Otriad.’ While the violent persona of the Bielski brothers is apparent in the preceding scene, in ‘Tuvia Kisses Lilka’ and ‘The Bielski Borthers’ the violin reaches a more amorous quality, but always abstains from the sappy love harmonies that could have been possible choices for such occasions. ‘The Bielski Borthers’ also does a wonderful job of showcasing the expressive harmonies heard in ‘Camp Montage,’ fundamentally trying to inculcate a sense of hope on the film’s viewers. While James Newton Howard creates a very solid composition for Defiance, the overall result of the score is somewhat disappointing. As mentioned before, the main problem for Newton Howard was having such a weak movie in terms of emotional content. Joshua Bell’s performance creates a very dynamic and beautiful musical expressiveness out of the violin and its themes, but the images and characters never seem to exemplify any of this. The film fails miserably at creating any sense of compassion or sympathy for most of the characters, hence leaving the score wandering alone in the evocative and meaningful realm. Outside the film, the score proves to be somewhat monotonous and very weak in terms of orchestral color, forcing the listener to raise the volume for most of the tracks. In the end, appreciating the score inside and outside the film becomes difficult.